Talking with kids and teens about books and writing is one of my favorite parts of being an author. 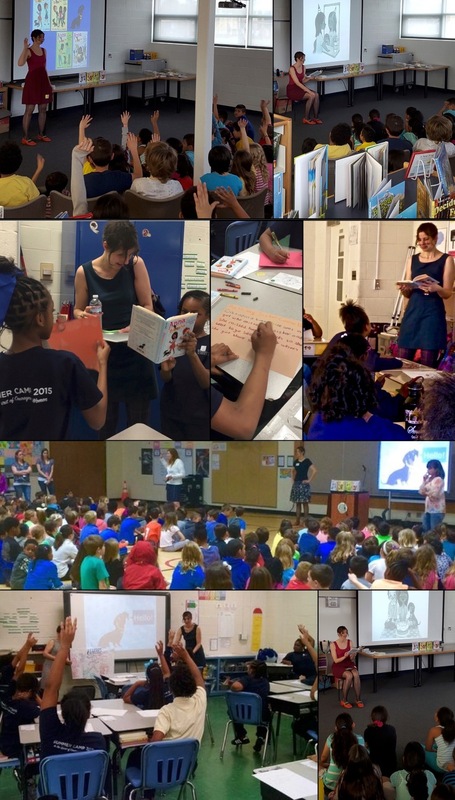 If you would like me to visit your school or library (or speak at your book festival or writers’ conference), I’ll be delighted to try to make it work. Please email me at anicamroserissi at gmail dot com to discuss rates and availability. For more information about Skype visits, please scroll to the bottom. Scenes from Anna, Banana school visits up and down the east coast. In my energetic, interactive presentation, I talk about my path to becoming an author and reveal the secrets of my writing process, from ideas and drafting to revisions and beyond. I share samples of my writing from when I was a kid, talk about what inspired me to write the Anna, Banana series and The Teacher's Pet, and share some of the bumps and challenges I encountered along the way, as well as how I overcame them. Each session includes time for a Q&A, into which I pack lots of writing tips, techniques, and encouragements for the kids to apply to their own writing in the future. I often also explore the question of what it means to be a good friend, as raised by the friendship issues and themes in the books. My elementary school presentations are best for students in grades pre-K through 5, and are suitable for both smaller and larger groups. I can do up to four 45-minute presentations in a school day, and am happy to adjust both timing and content to suit the school’s schedule and the students’ needs. If you would like me to have lunch with a special group of students, or lead a writing and revision workshop for older students or adults, I can do those things too. Schools and libraries: Belvedere Elementary School (VA), Blue Hill Public Library (ME), C.B. Jennings Elementary School (CT), Chase Emerson Memorial Library (ME), Community Park Elementary School (NJ), Cotsen Children's Library (NJ), Cranbury School (NJ), Deer Isle-Stonington Elementary School (ME), Dorcas Library (ME), Ella Lewis Elementary School (ME), Ethical Culture (NY), Fairmount School (IL), Grace Church School (NY), Heards Ferry Elementary School (GA), Hillside Elementary School (NJ), Greenwich Village School (NY), Hopewell Elementary School (NJ), Johnson Park Elementary School (NJ), Jonesport Elementary School (ME), Lalor Elementary School (NJ), Lewis Elkin Elementary School (PA), Little Red School House (NY), Maurice Sendak Community School (NY), McGalliard Elementary School (NJ), McKinley Elementary School (VA), Metea Valley High School (IL), Milbridge Elementary School (ME), Nathan Hale Arts Magnet School (CT), NEST+m (NY), NYPL Jefferson Market (NY), Pace Charter School (NJ), Park Slope School (NY), The Parkside School (NY), Piscataquis Community Elementary School (ME), Princeton Charter School (NJ), Princeton Day School (NJ), Princeton Friends School (NJ), Princeton Public Library (NJ), Princeton Young Achievers Program (NJ), Reiche Elementary School (ME), Ridge Elementary School (NJ), Riverside Elementary School (NJ), Rose Hill Elementary School (VA), Schneider Elementary School (IL), SeDoMoCha Elementary and Middle School (ME), Steck Elementary School (IL), Stonington Public Library (ME), Springfield Estates Elementary School (VA), Stratford Landing Elementary School (VA), Stuart Country Day School of the Sacred Heart (NJ), T. Baldwin Demarest Elementary School (NJ), Thomas Memorial Library (ME), Truro Public Library (MA), University Heights Elementary School (NJ), Washington School for Girls (D.C.), Waubonsie Valley High School (IL). Festivals and conferences: Anderson’s YA Literature Conference (IL), Anderson’s YA Fandom Frenzy (IL), Association of Writing & Writing Programs Annual Conference (FL), Brooklyn Book Festival (NY), Brooklyn Botanic Garden's Ghouls & Gourds Festival (NY), Cape AuthorFest (ME), Decatur Book Festival (GA), Maplewood South Orange Book Festival (NJ), Miami Book Fair (FL), nErDcampLI (NY), nErDcampMI (MI), nErDcampNJ (NJ), Newburyport Literary Festival (MA), Princeton Children's Book Festival (NJ), Rutgers One-on-One Plus Conference (NJ), SCBWI Winter Conference (NY), SCBWI Summer Conference (CA), Shreve Memorial Library Children’s Book Festival (LA), Southern Kentucky Book Fest (KY), Warwick Children's Book Festival (NY), William Patterson University Annual Spring Writer’s Conference (NJ). For news of upcoming public appearances and events, please visit the events page. Interested in a Skype visit? Please see below. I offer a select number of free Skype visits with classrooms or libraries (groups of 18 students or more) that have read one of my books together. If you are interested in setting up a Skype visit, please email me at anicamroserissi at gmail dot com. These 20-minute interactive Q&A sessions are best for students in first through fifth grades. For classrooms or libraries that would like a Skype visit but have not read one of my books together, or for groups smaller than 18 students, or middle school and high school groups, I charge $50 for a 20-minute session (Q&A) or $100 for a 45-minute session (presentation plus Q&A). A Skype visit with 3rd graders in Michigan. Photo by Colby Sharp.